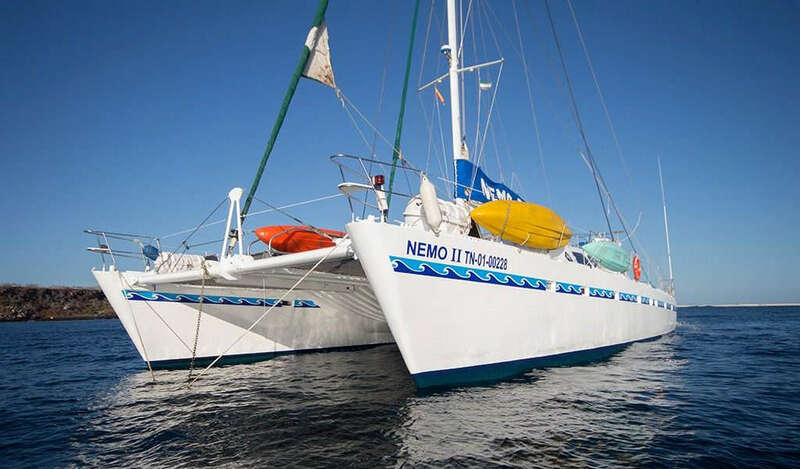 The Nemo Galapagos cruise is a perfect boat if you’re looking for a more adventurous cruise. 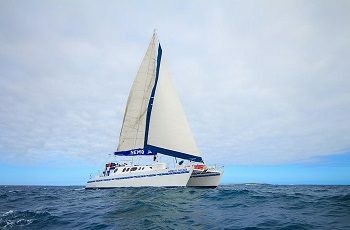 It is a small motor and sailing catamaran that offers a very unique experience of discovering the Galapagos Islands. 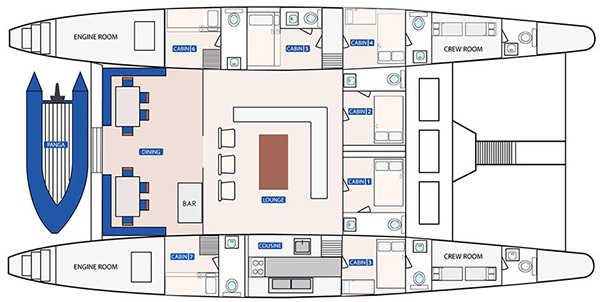 With its capacity of only 14 passengers, it offers an intimate way of traveling. 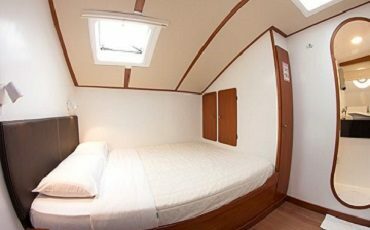 The catamaran will make for a more tranquil and enjoyable ride than the larger yachts. 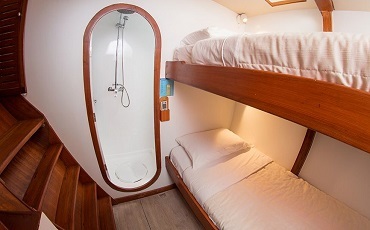 The catamaran provides cosy small cabins, welcoming social areas and the delicious food. 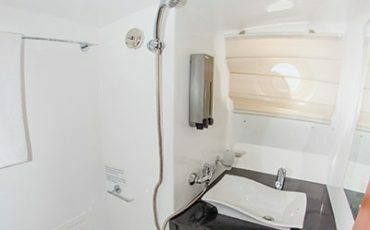 You will also be able to enjoy delicious showers with hot or cold water according to your preferences. It can get quite hot on the Galapagos Islands. However, you don’t have to worry about that since the cruise has air conditioner. 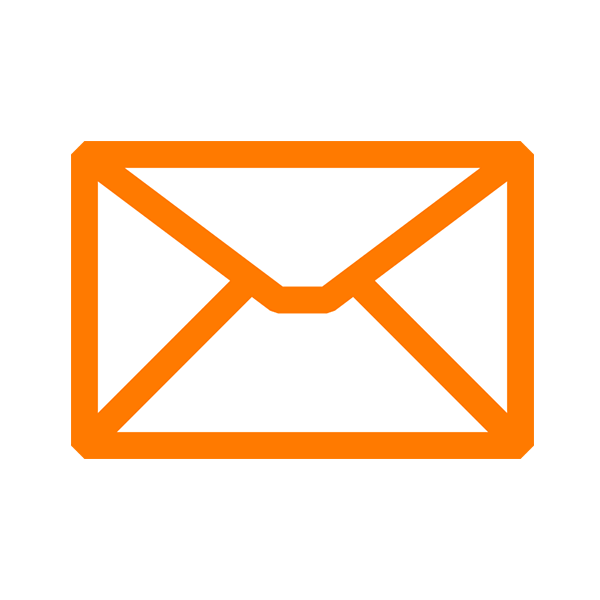 Upon arrival to Baltra airport your cruise guide will be waiting for you to transfer you to the cruise. Then, we will stop in Seymour which is situated in the north of Baltra. This is an amazing island where you will find a great variety of birds for example the royal frigate bird. AM: Visit to the highlands of Santa Cruz with their incredible vegetation. Here you can observe the Galapagos Giant Tortoises in their natural habitat. PM: You will visit the Scientific Station of Charles Darwin where you will learn about the history of the islands. 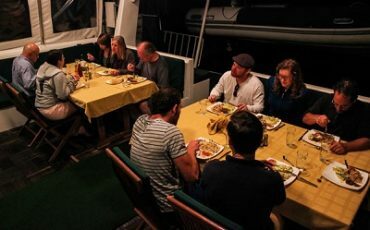 AM: Cruise to Isabela Island and visit to Punta Moreno, a volcanic landscape with numerous freshwater pools and lakes where you can often observe flamingos, ducks and other birds. PM: Visit to Urbina Bay. As a result of an eruption of Alcedo Volcano, in 1954, suddenly there were sections where the coast rose about four feet, making visible coral reefs. These reefs are covered with trees and muyuyo manzanillos. We will have the opportunity to observe land iguanas and mangrove finches closely. From January to June you can see turtles that live in the high mountains and occasionally visit the bay. AM: You visit Tagus Cove, a former anchoring place for pirates, buccaneers and whalers. Here, you will go down a steep trail that passes through a zone of dry vegetation and volcanic landscape with trees and cactus scalecia and you will have great views of the Darwin Lake. When you reach the top you can observe all the varied vegetation zones, Galapagos penguins, pelicans and flightless cormorants. 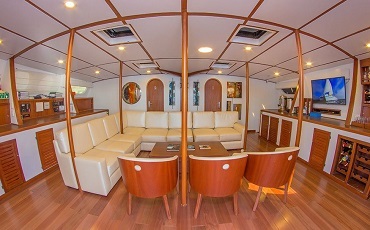 PM: Cruise to Fernandina and visit to Punta Espinoza, located between fascinating lava fields, cactus and mangroves. Within this unique setting we find various animals, such as sea lions, flightless cormorants and one of the largest iguana colonies of the archipelago. 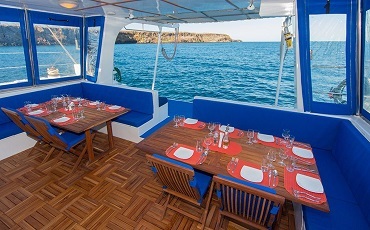 AM: Cruise to Santiago Island and visit to Egas Port where you will walk about 2km along the coast and see some beautiful natural pools where you can find sea lions, herons and a variety of sea and shore birds as well as sponges, barnacles, snails etc. Afterwards you visit Salt Mines. the return path covers a distance of approximately 8 km. PM: You visit the Espumilla beach where sea turtles nest. Afterwards you will go to Buccaneers Cove which was safe refuge for pirates, whaler and sailors. This bay is surrounded by several volcanic formations with seabirds nesting here. 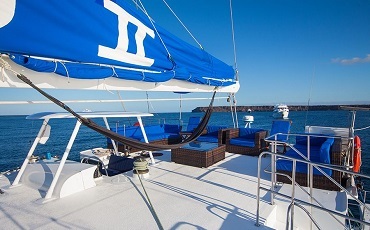 AM: Cruise to Rabida Island with the dark red volcanic beach. A short trail leads to a lagoon which is popular for flamingos. PM: You visit Sullivan Bay which is located on the east coast of Santiago Island. In this scenario we can see the contrast of landscapes of ancient and recent lava eruptions. After exploring the lava flows, you can swim or snorkel with playful sea lions. 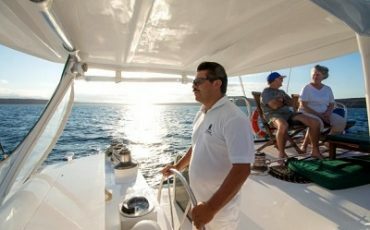 AM: Cruise to Genovesa Island and visit to El Barranco. You walk along a path of 1.5 km on the volcanic rocks. The second part of the trail is very delicate, so you should always stick to the route. Due to natural erosion, storm petrels often nest here you can also observe Galapagos petrels, wooden petrels, red footed boobies and other sea birds as well as sea lions. PM: Wet landing on Darwin Bay and walk on a short trail that leads to colonies of boobies and frigate birds. At the beach you can observe an interesting show: the frigates catching prey from other bird species of this area. 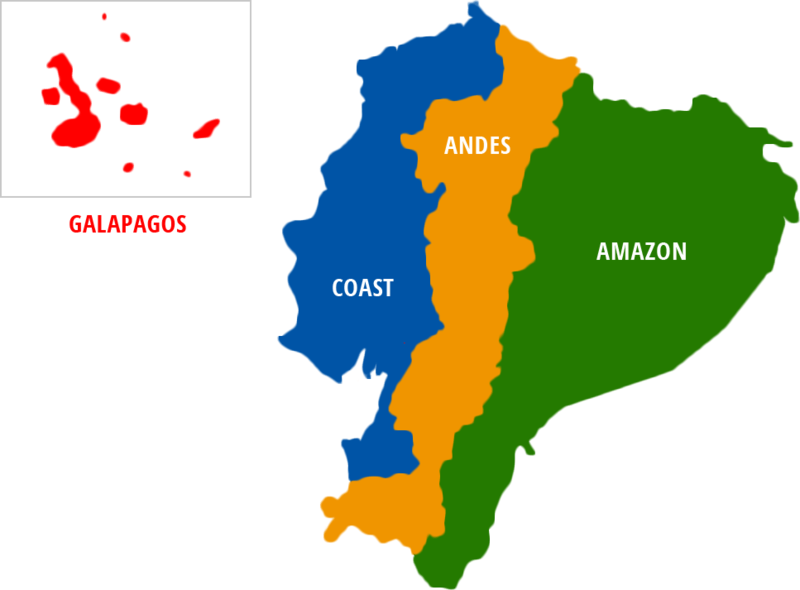 AM: You cruise around Daphne Islands which are situated among the central islands of the Galapagos archipelago. On a dinghy-ride you can appreciate the surrounding of the Islands. Afterwards, you will be transfer back to Baltra airport.